PHN FemCee-Vember Edition | Eve- 'Love Is Blind', 'Gotta Man', and 'Let Me Blow Your Mind' [VIDEOS] ~ Phresh Hott New! Eve Jihan Jeffers-Cooper (born November 10, 1978) is an American hip hop recording artist and actress from Philadelphia, Pennsylvania. She is also the inaugural winner of the Grammy Award for Best Rap/Sung Collaboration in 2002, for the song "Let Me Blow Ya Mind", with American singer Gwen Stefani. Eve was number 48 on VH1's "50 Greatest Women of the Video Era" list. 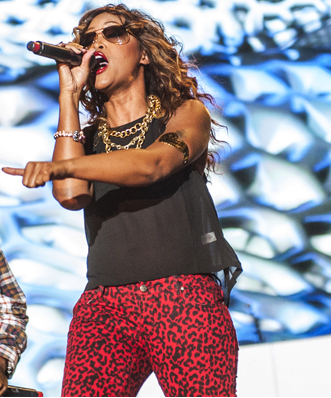 Eve first appeared on the Bulworth soundtrack as Eve of Destruction while signed to Dr. Dre's Aftermath Entertainment. She did not receive much promotion with big releases soon coming from Dr. Dre, so she collaborated with DMX and the Ruff Ryders on her first single as a Ruff Ryder DJ Clue? 's The Professional, along with other Ruff Ryders' compilations. Her next single, "What Ya Want", featuring Nokio the N-Tity of Dru Hill, became a top 40 hit on the U.S.Billboard Hot 100 peaking at 29. Her 1999 debut, Let There Be Eve...Ruff Ryders' First Lady, was an unprecedented success, making it the third album by a female rap artist to top theBillboard 200, behind Lauryn Hill's The Miseducation of Lauryn Hill (1998) and Foxy Brown'sChyna Doll (1999). Two singles were released from the album: "Gotta Man" and "Love Is Blind" featuring Faith Evans. The first one peaked at number 26 on the Billboard Hot 100, the second one at number 34. In November 1999, Eve featured on Missy Elliott's single "Hot Boyz (Remix)" along with Nas, Lil Mo and Q-Tip. The song became a hit, spending 18 weeks at number one on the Hot Rap Singles from November 16, 1999 to March 7, 2000, and reaching number 5 on the Billboard Hot 100 .